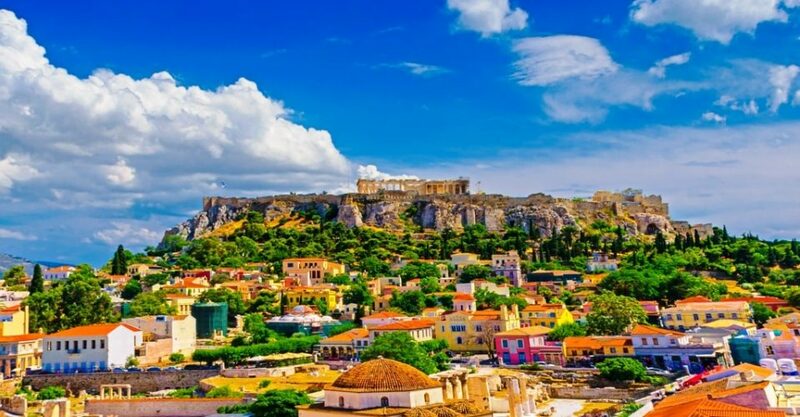 Athens, one of the oldest cities in the world, the city of Gods, the cradle of Western civilization and the intellectual beacon of the ancient world is the historical capital of Europe with a population of over 4.5 million people. 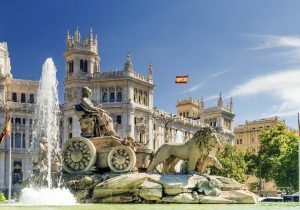 The city has had such a long history, dating back to the 5th Century BC and you’ll be able to witness the cultural and historical richness that is evident in all of its architecture and its streets. Every street leads to a fascinating monument, the Acropolis towers over graffiti-filled streets, tradition juxtaposes with modernity, and historical buildings sit right next to clubbing districts. 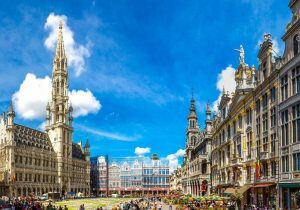 You’ll be spoiled for choice with all of the grand sights, the incredible cuisine, the nightlife, and the rich culture that has prevailed throughout all of these years. You’ll be excited and exasperated as you wander the same city where philosophy, democracy, theatre and a lot were born, and you’ll be walking the same streets Socrates walked in! Athens has a dozen symbols of classic architecture, and it will draw you in to discover the essence of Greece. With all of the things you can do in Athens, it might be challenging to know where to begin, so here’s our recommendation on how to spend two days in Athens! The Acropolis is the most important ancient Greek monument, and one of the most important monuments in the world. You will see the Acropolis majestically rising above the concrete jungle as you walk by. You’ll be awe-struck when you arrive and see real-life remnants of monuments that were once magnificent, to see such an old culture that flourished thousands of years ago come to life, and when you realize that the Acropolis the embodiment of the essence of Greek culture, history, and architecture. The most famous landmark, of course, is the Parthenon Temple. However, there are a lot more other things that you can check out. The Acropolis was once used as a natural defense due to its massive size, and people have lived here as early as 5000 BC – now allow this information to change how you perceive the Acropolis; you are literally standing right where some of the most important civilizations in the world started, lived, fought and thrived. You enter through Beulé Gate and then pass through Propylaia. 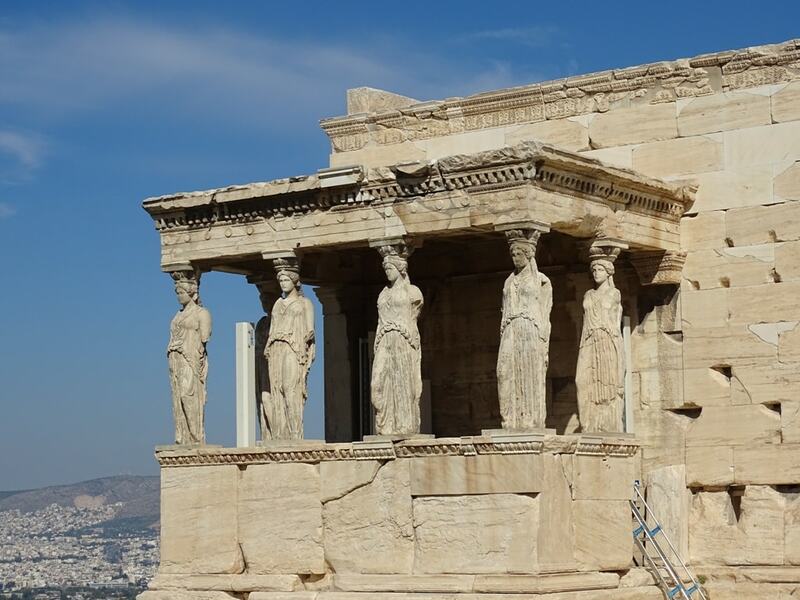 From there you can choose to visit the Temple of Athena Nike built in the 424 B.C or the Parthenon. The Parthenon is most definitely the most famous building in Athens and the most photographed and visited building on the Acropolis. It’s a breathtaking temple that worshiped the cult of Athena the Virgin back then, and even though you cannot enter right now, you may still walk around the exterior and check out the incredible details of craftsmanship, specifically on the columns. The columns and the sculpture all symbolize the wealth and class of Ancient Greece. 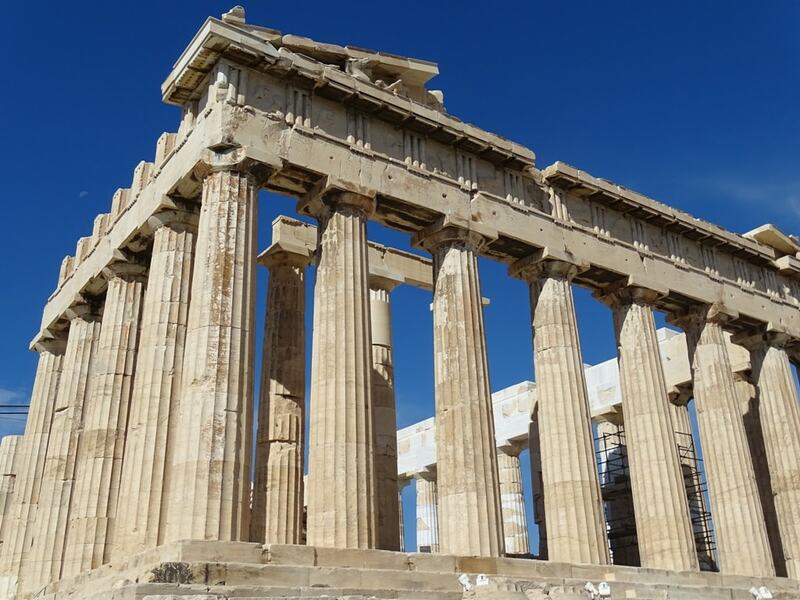 Did you know that he Parthenon meant “the apartment of the Virgin” and was built for the goddess Athena Parthenos who gave the city all of its wealth? 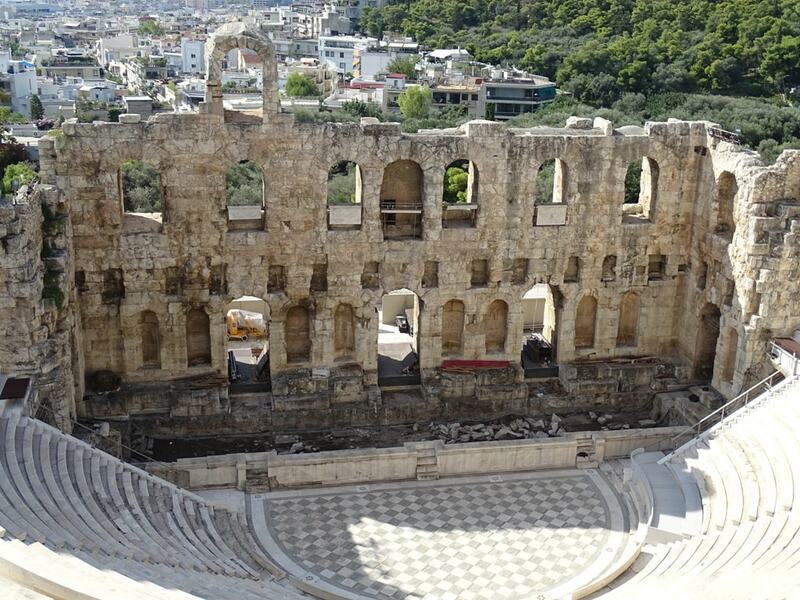 This fourth-century BC theatre is considered the birthplace of European theatre! It’s one of the earliest preserved in Athens! Back then it was used for festivals, mostly ones in honor of Dionysus – the god of wine and theatre, and it can carry over 17,000 spectators. This is the theater where the most popular plays were performed for the first time including works by Sophocles, Aeschylus, Euripides, and Aristophanes. This is another theater. However, this is one where you can actually experience a live classical performance. The ancient amphitheater, also sometimes called Herodion, is still functioning until today even though it was built about 161 A.D. by Herodes Atticus, a Roman philosopher, and teacher. The mixture of antiquity, the incredible acoustic experience, the performance itself of the tragedies, and the night sky filled with stars is enough to make you want to visit the theater right now! Tip: Try to visit the archaeological site of the Acropolis as early as possible to avoid the crowds and the heat especially during the summer months. Tickets: There is a special ticket package for visiting most of ancient Athens monuments costing 30 € full and 15 € reduced which is valid for Acropolis of Athens, Ancient Agora of Athens, Archaeological Museum of Kerameikos, Hadrian’s Library, Kerameikos, Museum of the Ancient Agora, North slope of Acropolis, Olympieio, Roman Agora of Athens, South Slope of Acropolis. The ticket is valid for five days. If you just want to visit the Acropolis tickets cost 20€ from April 1st to October 30th and 10€ from November 1st to March 31st. After you’re doing visiting the actual sites, it’s time to visit one of the best museums in the worlds that is purely devoted to the Parthenon and its surrounding temples. Before going over parts of the museum that you need to see, you have to understand that the museum itself is a magnificent building and an incredible piece of architecture in and of itself. Large glass panes, a wonderful sense of space, light and all shades of marble existing around you, bathed in UV light, make just wandering around the museum a fun experience. You can also have incredible views, since the museum is perched atop Athens, and you can check the panoramic views of Athens or the direct view of the Parthenon itself. Ground floor – “The Acropolis Skopes” which include all of the objects that were found in the settlements, houses, and sanctuaries that were all scattered around the Acropolis. First floor – Check out the Moschophoros, which is a statue of a man. Third floor – take in the incredible views of both the Parthenon and all of Athens. This impressive ruined temple lies in Central Athens to pay homage to the father of all the Olympian gods – Zeus. It was actually supported by over 104 Corinthian columns, but only 15 of those remain standing. You would be surprised to know that this massive temple actually took 700 years to finish. 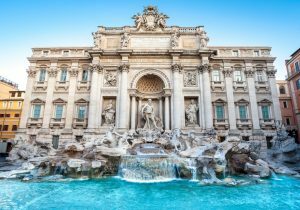 You’ll be able to see the remains of Roman houses, the giant ivory and gold statues of the king of Olympian gods, the city walls and a Roman bath as well!. Did you know? Back then, the size of the temple directly reflected the importance of the person, and thus (even though Athena had all of Athens dedicated to her) Zeus was an extremely important figure, and that’s why the Temple of Zeus is that big! This triumphal arch was built to celebrate the arrival of Roman Emperor Hadrian to thank him for his benefactions for the city of Athens. It actually once served as one of the seven gates that were used as a defense during the attack against the Albanian raiders. It’s beautiful to be able to walk around and stumble upon the arc, with all of its glory and its symmetry. You’ll be able to see the two different type of inscriptions that are varied in the architrave – one reads “This is Athens, the ancient city of Theseus,” the second reads “This is the city of Hadrian and not of Theseus.” The first one looks towards the Acropolis while the other faces the new city. 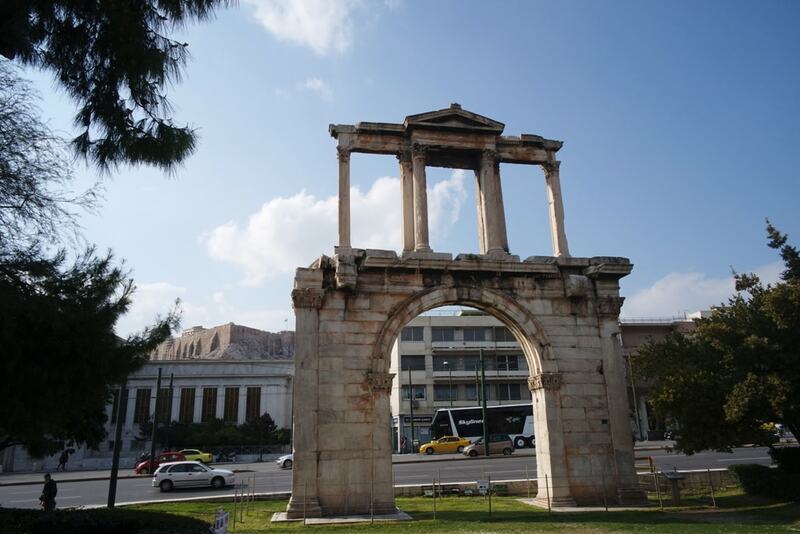 The reason for this is because the arch lies on the ancient street that was the bridge between the old city of Athens, to the new Roman part of Athens (made by Hadrian). End your day by having dinner at and walking around one of the oldest neighborhoods in Athens where most of the streets are closed to pedestrians. It consists mainly of neoclassical houses, pedestrian streets, beautiful views, and much more. Plaka was the oldest district in Athens, and it has now become an area full of restaurants, little taverns, jewelry stores, and cafes. 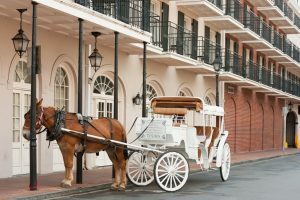 There is a wide range of shop variety from normal touristy stores to more authentic ones selling weird, quirky souvenirs or antiques. You can also cool off at a tavern and drink coffee as you watch people pass by or go to the Museum of Greek Folk Art! If you find the monuments to be overwhelming and if you find that visiting them would be too much of a hassle, then you can take a 4 hour guided tour from 9 am everyday in either English or French where you check out the most important highlights like the Acropolis, the Zeus Temple, the Ancient Agora, and much more. You’ll also learn about all the Gods you’ve always heard of but never learned about, and you’ll learn about the ancient society and how people lived back then. Find here more about the Mythology highlights tour. Slightly less busy than Acropolis but still as impressive, just the act of strolling around Agora will overwhelm you with the amount of history that hangs over this place. It’s a beautiful place to wander aimlessly around greenery and ancient ruins that were once a part of the heart of Ancient Athens. Agora was the commercial hub of ancient Athens, the marketplace, and it was the focal point of all social, economic, political and any intellectual activities and it was the pulsing heart of all of Athens. After all, Agora directly translates to “a place of gathering”. The Agora once ha statues, shops, dozens of markets, schools and even Socrates used to lecture young students there at the Stoa f Attalos II. You can also visit the Museum of Agora Excavation! Now you’ll see the juxtaposition between modern and tradition as you move from the ancient pulsating heart of the city to the new one. The ancient square is wat keeps this city going, and it’s main transport hub! It’s usually the place to meet friends, have a meal, relax after work, go shopping, or just people-watch! War Memorial of the Unknown Soldier – Dedicated to all of the unknown soldiers who died during the war. Changing of the Guard Ceremony takes place. 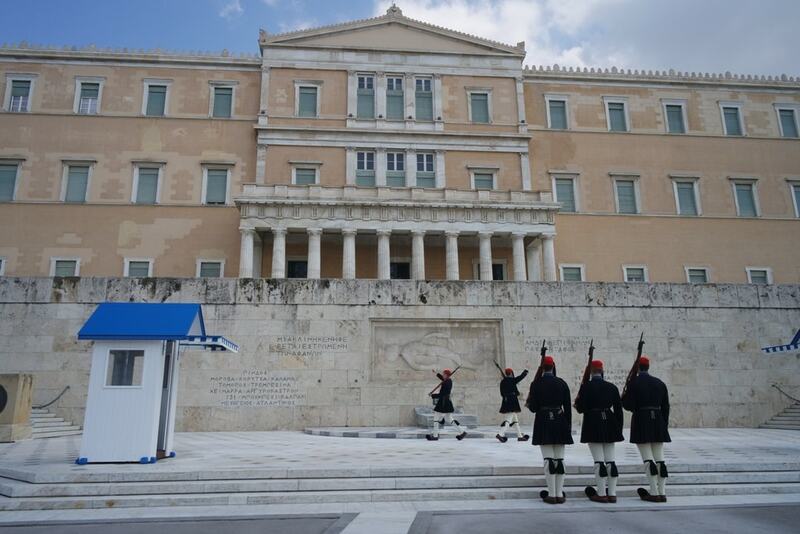 Every hour exactly, the changing of the guard takes place where the presidentialguards dress in their traditional uniform to pay tribute t all of the war victims. You are not allowed to touch them, however. This stadium has an incredibly long, interesting history and is the birthplace of the Olympic Games. 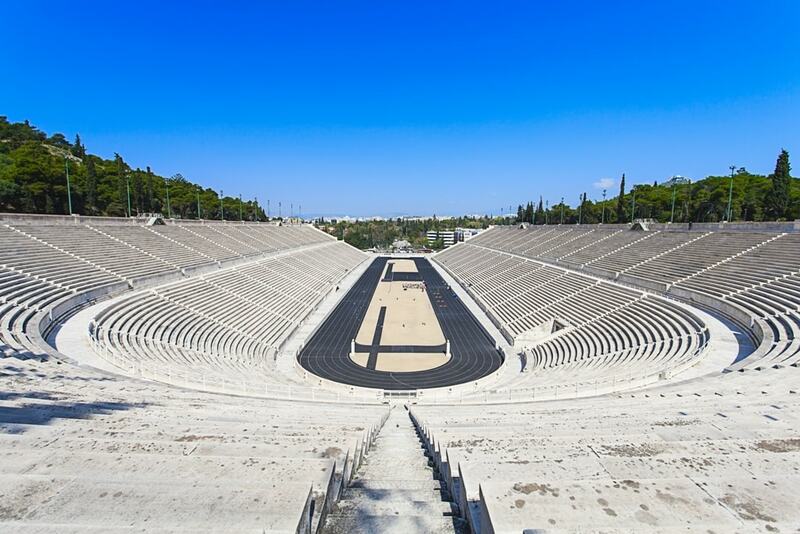 It was constructed in the 4th century B.C and its main purpose for it back then was for the male athletes to compete in the games but now it has become one of the most important stadiums in the world. It is all made of marble and can hold up to 60,000 spectators until today! Usually, when we think of Athens, images of completely ancient monuments come up to mind, right? However, the streets of Athens are filled with incredible pieces of graffiti making it a very colorful town with all sorts of art and graffiti, from posters to murals, on the walls. This area used to be one of the most dangerous in Athens and had a dangerous reputation but it slowly and surely transformed itself into an incredible, fashionable, edgy neighborhood. 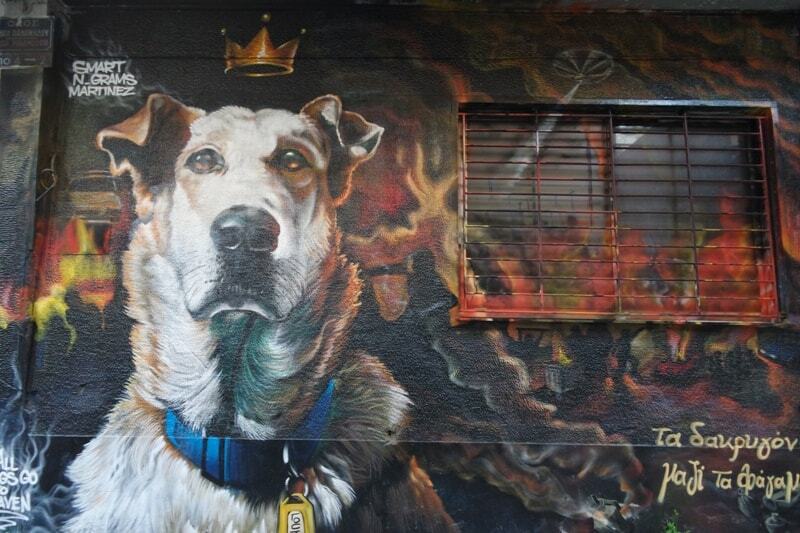 As you wander around, you will be able to see not only wonderfully authentic craftsmen’s store, but also a lot of street art and art galleries like Sarilla12 and much more. A lively square, a flea market, and a neighborhood that is so colorful with colors and murals. 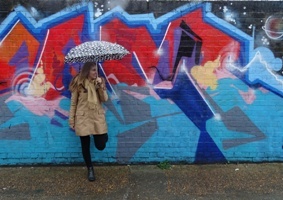 There are all types of graffiti there – from quirky and funny, to completely unprofessional, to very political ones! 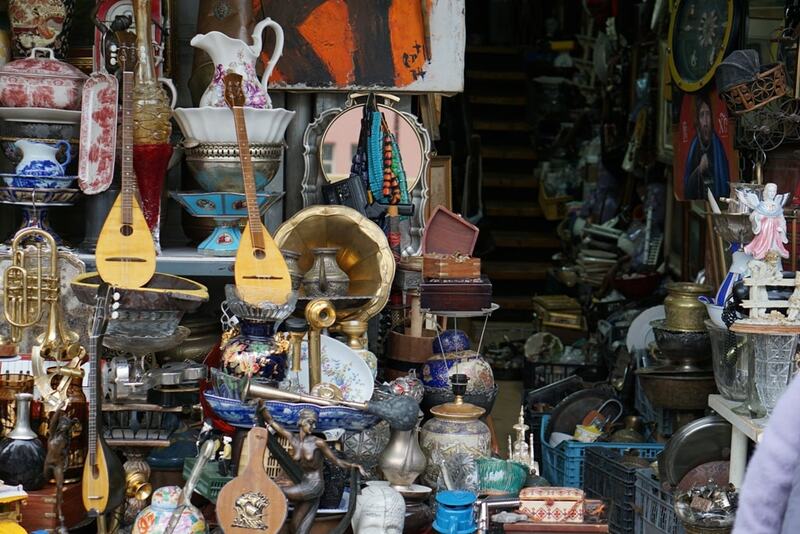 After you’re done being inspired by the incredible street art and taking pictures of it, it’s time to go to the Monastiraki Market. Monastiraki is originally a busy square with street performers, shoppers, and of course – lots of tourists. After you’re done, you can go to the square and have a coffee at one of the many cafes that dot the streets. This is where you go to truly get a feel of what Athenian life really is like, to live like a local for an hour or two! You enter this glass-roofed building called the Simotiki Agora and you are met with the best representation of the Athenian food scene. You get two sides of the market – one for meat and one for seafood, and there you see every type of meat and fish imaginable. You’ll be a part of the hassle and the hustle and bustle of the markets as locals rush to buy the freshest produce and vendors shout out the prices and their promotions. It’ the perfect balance between sensory and gastronomic delight. You can discover a country through the gastronomic experience that it offers, and you can further discover Athens through its food. After checking out the most important monuments, you can embark on a journey of discovering the best Greek pastries, wine, cheese and salamis. You’ll be going on a guided culinary tour of Athens, have an authentic Greek breakfast at a café that is a century old, purchase your choice of cheese and meat from a market, sample different types of food, try some Athenian coffee, and purchase souvenirs to take home. Click here to find out more about the Athens Food Tour. So this is how you spend two days in Athens, the perfect mixture of visiting historical monuments, museums, incredible neighborhoods, local markets and quirky murals – all in 2 days. You can easily enjoy the grunge and grace of Athens, and take in all what it offers from majestic monuments, to the rich culture, to purely white buildings, and an incredible experience overall.